Mantra: “I can do all things through Christ who gives me strength”. Phil 4:13 I write “Phil 4:13” on my wrist before every race. I can’t tell you how many times I look down at it and repeat it over and over. I’ve been running for 16 months now. I think when I started it may have been actually walking. I started with a 5K, then 10K, then completed my first half-marathon within 6 months of my running journey. Since that time I’ve completed a total of 4 half-marathons. I’ve also done 2 sprint triathlons and 3 duathlons. I’m currently training for my first full-marathon. My love for distance running began when I signed up for a Marathon relay (my leg was 5 miles) in honor of my sister-in-law who battled and BEAT breast cancer. Once our relay training began and I was easily able to do 5 miles, I knew I wanted to do more for her. I found a replacement for my leg of the marathon (my brother-in-law) and signed up for the half-marathon. She has been a continuous source of motivation. However, I truly believe you can’t rely on any one person (including yourself) for sole motivation. I believe strength, real strength and endurance, comes only from Jesus. Jesus and my faith is what has kept me going through good runs and bad runs. Especially bad runs. 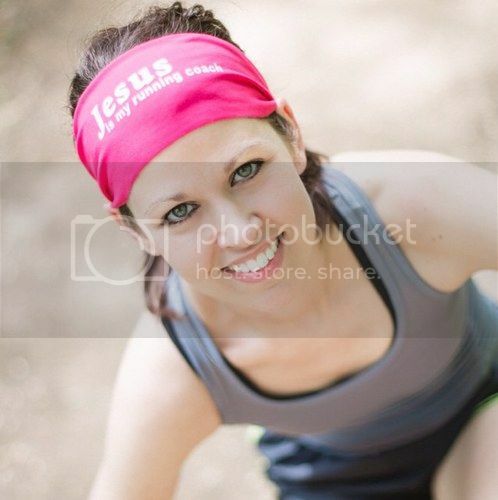 Ever since I started running, I’ve always worn my bondiband that says “Jesus is my running coach”. I don’t have a “running buddy” or training partner. I run with Jesus. It is my time to worship Him, pray and spend time in constant conversation with Him. I also have a difficult time running without music. My favorites on my playlist are Moriah Peters, Rend Collective, Selah, Truesdale Band, Big Daddy Weave, Travis Cottrell, Matt Maher, Toby Mac, Mandisa, Newsboys and 33 Miles. My “theme” song has been “Well Done” by Moriah Peters. The lyrics are amazing for any runner seeking to honor the Lord. I try to time my playlists so I end every race with that song. The only one I need to hear “Well Done” from is my God. My “pump me up” song has been “Build Your Kingdom Here” by Rend Collective. I remember one race where that song came on and I was super tired…I think it was the last 2 miles of the race. I looked up and saw a church steeple in the distance and really picked up the pace. I truly try to spread the Word by Running in the Word. What is your favorite race you have ever done or place to run?I have two races that were truly special. My second half marathon was in Chicago along the lake-shore. Although it was windy and 30 degrees, I was really able to feel God’s beauty and felt like He was surrounding me. Another memorable race was a recent 10K in my hometown. This was the first race my dad was ever able to watch me at. I also happened to have a PR (57:14) which is pretty speedy for me! I was at “home” and also felt at “home”. Start slow, have a plan and have someone who will hold you accountable. I did 2 out of the three. I started increasing my mileage too quickly because I was having so much fun. I ended up injuring my knee. This injury still lingers and I always get knee pain around mile 7. I’ve been able to use KT-Tape to help manage it. I had a good friend who was an inexperienced runner who sent me encouraging texts, prayed for me and would check in on me. I printed out a plan and posted it on the fridge. That was essential. People would ask me about it. It was visible.